Another prestigious Pentaward win for P&W! The Pentawards are the most prestigious worldwide design competition, entirely devoted to packaging design. Pemberton & Whitefoord were awarded a Silver award yesterday for their Switchle branding project, a highly distinctive, ownable identity that taps into an intriguing 17th century farming connection. Adrian Whitefoord, Partner at P&W art-directed the project for a client of over 20-years, Healthy Food Brands. 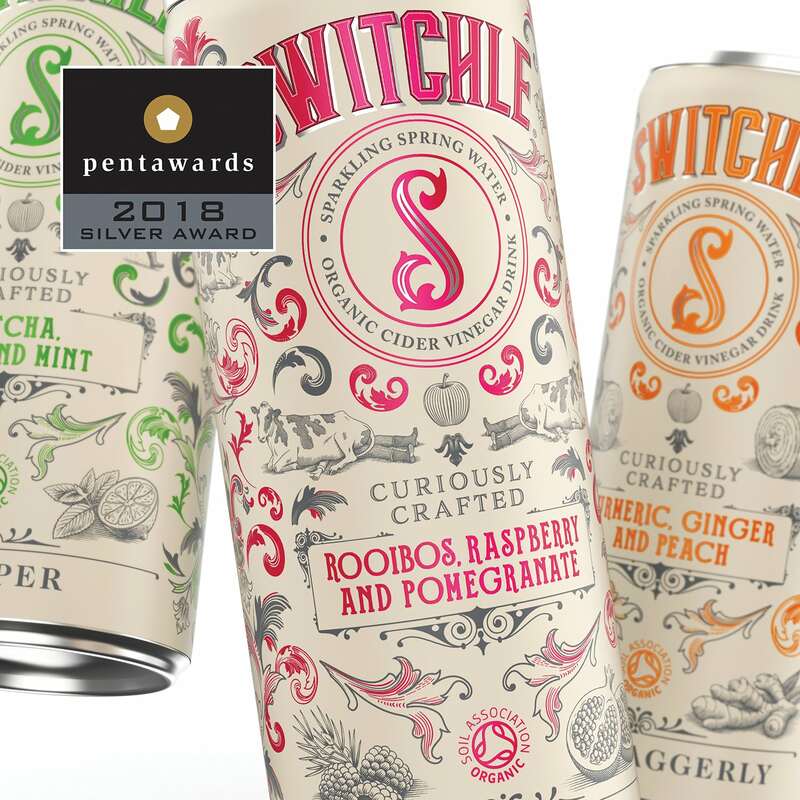 “We are so pleased to have been awarded a Pentaward for our Switchle branding project. Key to the success of the design we produced was the encapsulation of British eccentricity via the use of illustration, decorative typography and quirky Olde English phrases. Our team are so pleased that this quirkiness resonated with the judges, particularly as one can design featured a farmer unfortunately positioned under the posterior of a complacent cow; that must be a ﬁrst for the Pentawards! Our “curiously crafted” design, originated by Creative Designer Matthew Crowley, perfectly represents the intriguing tipple that, despite having recognition from health-conscious Americans, is entirely new to the UK market. Winning a Pentaward is always a great feeling, the competition is a great platform for creatives to be acknowledged and winning an award vindicates that our design solution is eye-catching, unique and compelling. What is most important from our perspective is that our creativity resonates with consumers. P&W’s intention is always to help ensure commercial expectations are met for our clients and since Switchle’s launch earlier this year, consumer feedback has exceeded all predictions and expectations. We’re very proud of this."